Horrible puns aside, the Answer MX boot didn't just throw all their money into the style category and leave the rest alone. There's plenty of comfort and safety to go around. Check out the improved sole for long-lasting durability, a custom molded ankle support, and the intensely modified aluminum buckles, which are build around a 2-stage system for long-lasting, protected closure. The buckles are custom anodized, a process which is used to naturally increase surface thickness in metals, ultimately improving corrosion resistance, normal wear-and-tear damage, and sunlight oxidation. Seems like a lot of attention went into making the buckles practically perfect, but isn't a secure fit one of the most important things on a rider's mind? It should be, right? 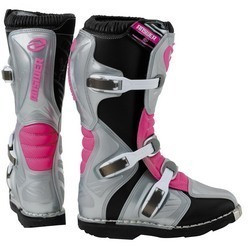 Answer's MX boots are available in standard US whole sizes 6-10.